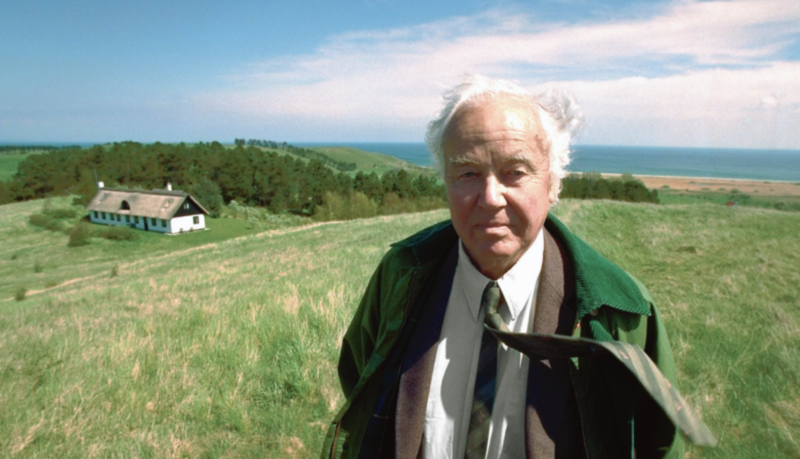 What: The celebration of danish poet Thorkild Bjørnvig, born 2-2-1918. Through music/soundscapes/sonic tappestries based on Bjørnvigs Environmental Poem Concrete, composed by Rasmus Lunding in the 1990´ties. Executed on a 32 channel D3DA speakersystem. Where: In the Dome of Visions at Pier 2, Aarhus Harbour. When: 9pm, friday the 2nd of February, 2018. Thorkild was a local (as in DK) hit in the 50´ties, 60´ties up through the 70´ties, back when poetry publishings still occasionally managed to achieve sales figures similar to popular music releases. Thorkild Bjørnvig was born on the 2nd of February 1918. He died at the age of 86 in his home on his beloved Samsø. Therefore we celebrate his 100th year on February the 2nd 2018. Before his death, when he was around 80, I had the fortune to meet him, inteview him and record him reading samples from his vast production over the course of 2 days in his home at the north-tip of Samsø – Issehoved – a unique moraine landscape formed during the last iceage, where he spend the last 30+ years of his life. -He was an academic specialzing in german litterature, particularly Rainer Maria Rilke, the focus of his master thesis. He later received a Dr. Phil. at Aarhus University (the highest possible academic grading in Denmark). A major part of Thorkilds own poetic outcome can be seen as extending from his profund and indeept knowledge and relation with german literary traditions. Simultaneously balancing a unique personal, contemporary and – to a certain degree – nordic roothold. -From the first publishings in the 40´ties right to his latest works, one find a clear almost radiant serenity regarding Man´s relation to Nature. Man is of Nature and as such dependent on it. Since Nature is a reality outside Man – a corrective perspectivating human display and acting – Nature is not of Man -ultimatively has no need of Man. To Bjørnvig, Nature “makes no sense and has no meaning” in the traditional occidental understanding of these tems. Only through unreflected focus on sensoric sensations in the Wild. One can conceive Nature. Nature is not a prop for human existential reflection. According to Bjørnvig himself, this understanding of the surrounding Nature, he shared with the likes of Henry David Thoreau, Herman Melville and Loren Eiseley among others. -From the 70´ties onward Thorkild Bjørnvigs relation to Nature as expressed in his poetic work gradually transformed and departed to a certain degree from his – untill then – strict use of structures and meterings normally attributed lyric poetry, to a more narrative – almost “poetric concrete” style where one sense more desperation, more outcry towards Man´s destruction of Nature. This is most clearly seen in his “Miljødigte” (“Environmental Poems”) from 1975. And in his “Økologiske Essays” (“Ecological (-or; “Orcanic”) Essays”) from 1978. Contrasting this, and most profoundly seen in his last work “Siv, Vand og Måne” (“Reed, Water and Moon”) from 1993, are poems reflecting the man, Thorkild´s, personal experiences of, with and in Nature. Intensely focused observations expressed sublimely condensed, almost in a haiku-like form -Deep, long and vast in short, minimal and beautiful stanza. A man who was a highly esteemed academic – but also a man who – in his own words – had conversations with trees. It is also here, in my opinion, we find what fueled his long lasting and bitter outcries against the technological and industrial developments throughout the 20th century. -He felt the pains enthrusted upon Nature my Man´s careless, infantile, greedy and blind enthusiasm of all things new. He was not against technological developments at all. But long before it was on but a few people´s agenda, he sensed the damage arrogant wrecklessness can cause when technology are used “without a sense of maturity, without mind and spirit”. -It was with the here mentioned releases in mind I first approached Thorkild Bjørnvig by letter in 1997 and asked for permission to use his poem “Det Nødvendige” (“The Necessity” or “The Necessary”?) in a commission for a 25 speaker system installed in the council square in Cph. The narration being done by singer/composer Line Tjørnhøj. This piece was later released on Sonic Circuits VI (https://www.innova.mu/albums/sonic-circuits-festival-electronic-music-and-art/sonic-circuits-vi). -Then in 1998 Bjørnvig agreed me a visit in Issehoved to record him. These recordings was used in a piece “Liv uden Hensigt” (“Life with no Intent” ?) written for the Danish Radio programme “Lydmuren” in 1999. These are the pieces I will perform on the 2nd of February 2018 on Aarhus University´s 32 channel D3DA system, installed in the Dome of Visions early 2017. In honour of, among other things, one of the most clearcut and profound environmentalists having lived in Denmark. Bear in mind, the narration in the pieces are in danish. But the sonics are universal, and hopefully – as intended – reflect and mirrors the spoken/sung words. -The celebration will last approximately 1 hour. -Observe that hanging out in the dome can be an indeed chilling experience this time of year! Bring lots of warm clothing! -There will however be comforting warm rum toddies. Vision for bæredygtige fremtider: Dette event er en fejring af og hyldest til en af de første – hvis ikke den første – kunstner, der i stort omfang og på skarpeste og fornemste vis satte bæredygtighed og klimaforandringer på dagsordenen i den danske miljødebat. Det var på et tidspunkt, da termer som “bæredygtighed” og “klimaforandring” endnu ikke var i brug. Man talte om forurening og miljø. Konsekvensen af menneskelige adfærd og resultaterne heraf, som han minutiøst begyndte at researche og notere sig fra 1960´erne og frem til sin død i 2004, bliver menneskets egen achilleshæl, hvis ikke en holdningsændring finder sted. I 2018 er fokus på bæredygtighed og klimaforandringer i høj grad rettet mod menneskets, vores egen arts, overlevelse her på planet Jorden. Det var kun i sekundær grad Bjørnvigs fokus. For ham lå menneskets overlevelse implicit i, at den holdningsændring, han mente var nødvendig, handlede om at give Naturen plads og råderum, ikke at se den som en ressource, som en ting. Men som et Eventyr. Det største tab, Bjørnvig forestillede sig, var ikke tabet af Mennesket. Men tabet af det Mennesket er af: Naturen. Hvorefter alt, hvad der stod tilbage, var Tingene, de menneskeskabte Ting – og Tingsliggjorte Dyr. Altså for tingenes skyld bl.a.